Austrian architect; brother of Alexander Marmorek; born at Skirta, Galicia, April 9, 1863. He studied at the polytechnic high school at Vienna and took a postgraduate course at Paris. Returning to Vienna in 1889, he settled there as an architect. Several important works have been undertaken by him, including the illuminated fountain at the Forestry Exposition of 1890 at Vienna, the music-hall at the Vienna Musical Exposition of 1892, and the plan of the villa district of Assee. 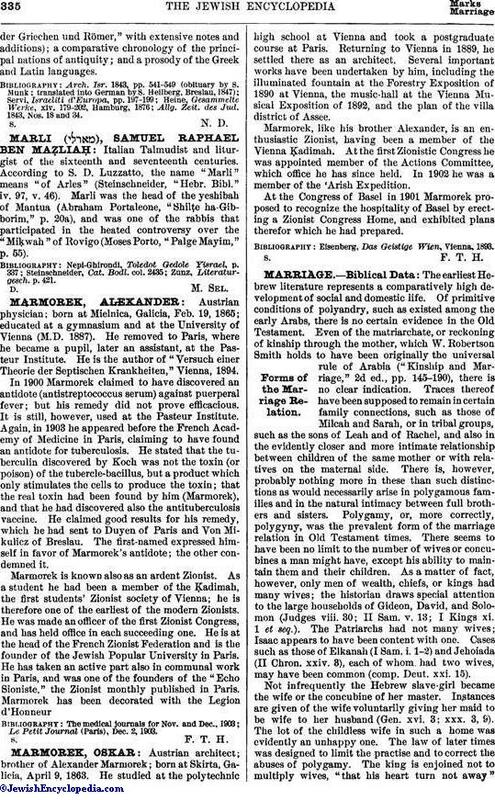 Marmorek, like his brother Alexander, is an enthusiastic Zionist, having been a member of the Vienna Ḳadimah. At the first Zionistic Congress he was appointed member of the Actions Committee, which office he has since held. In 1902 he was a member of the 'Arish Expedition. At the Congress of Basel in 1901 Marmorek proposed to recognize the hospitality of Basel by erecting a Zionist Congress Home, and exhibited plans therefor which he had prepared. Eisenberg, Das Geistige Wien, Vienna, 1893.